A product that is vegan does not contain any animal ingredients or animal-derived ingredients. This includes, but is not limited to, honey, beeswax, lanolin, collagen, albumen, carmine and some cholesterol, gelatine products and many more. The term “vegan” does not means that a product is free from animal testing. The quickest way to ensure products are vegan is to look for companies that use the PETA Beauty Without Bunnies Vegan Logo. For a product to be cruelty-free, there should be no form of animal testing at any point in the creation of a brands products. However, a product can be cruelty-free and not be vegan. It’s common for companies to not test the final product on animals, but to test it along the way or to use ingredients that have been tested on animals by a third-party. “Required by law” animal testing is also common. This means that the finished products are tested on animals by a third-party to comply with various regional laws around the world. These products, no matter what the packaging says, are not cruelty-free. Can something be called cruelty-free AND vegan? YES, this means that the product has not been tested on animals AND it also does not contain any animal ingredients and by-products. To find suitable products that are both vegan and cruelty free, look for the PETA Beauty without Bunnies Cruelty Free and Vegan logo. Are all Vegan products ‘natural’ and ‘organic’? No, products labelled ‘vegan’ don’t necessarily mean that botanical replacements are used in place of animal-derived ingredients. In other words, vegan products can be made from either plants and minerals or safe synthetic ingredients. ‘Natural’ means that the product does not contain anything artificial or synthetic. It is very possible for a product to be natural but not organic, although all organic products are, by definition, natural. Some natural ingredients undergo further processing with synthetics which makes them naturally derived synthetic products. Why use synthetic rather than ‘natural’ products? It is a growing trend in the industry to promote products as being ‘natural’, ‘organic’ or ‘naturally derived’. However, some claims about the natural-ness of a products are misrepresented and misunderstood. Synthetic ingredients enable manufacturers to make white or very pale coloured waxes which is impossible with pine-based waxes. They are also very low odour. They are generally much more flexible, remove more cleanly and can be used over the same area of skin several times without causing any harm to the skin. More people are allergic or have reactions to ‘natural’ waxes than they do to synthetic waxes. ‘Natural’ waxes are not really what most people would call natural. They are made of mixtures of rosin and waxes. The rosin used is obtained from pine trees or Chinese gum trees – but it needs to be chemically treated to make it suitable to use in a depilatory product. It is also acidic which is why there is more likely to be redness on the skin after using a pine-based wax. The most common wax used in a ‘natural’ wax is beeswax; however it will still need to contain other waxes as well as fillers, perfumes and dyes. Natural ingredients often require a refining step to remove impurities. The quality and performance of these ingredients varies depending on the source, harvest conditions and treatment of the materials. As they are natural products they will vary from batch to batch and therefore the finished products can vary. 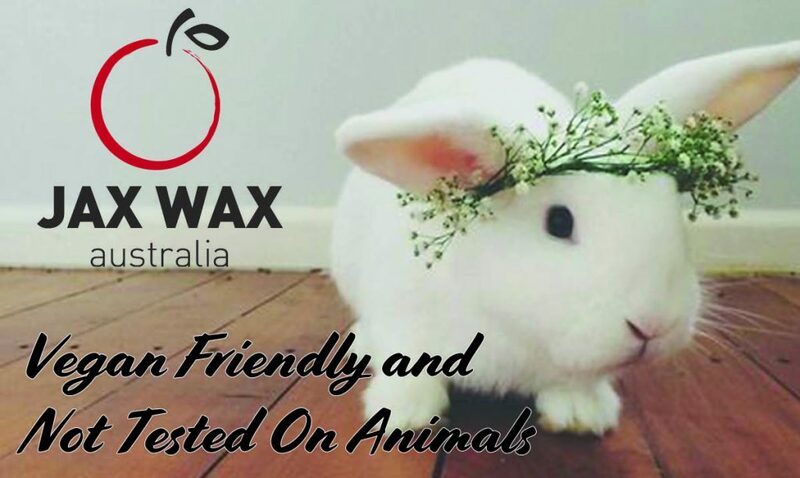 Jax Wax is different, proudly vegan and cruelty-free with PETA certification. When you buy Jax Wax Australia products, you’re casting a vote for the kind of world you want to live in. By supporting a vegan friendly and cruelty-free company, you are helping a good cause and the movement towards ending animal testing practices. You can choose beauty that is good for you – and your animal friends. This entry was posted in General news, Industry News and tagged Beauty Without Bunnies, Cruelty Free, Jax Wax Australia, PETA Certified, Vegan, vegan wax, What does Cruelty Free mean, What does vegan mean.